Many iconic buildings are positioned along this side of the lake. 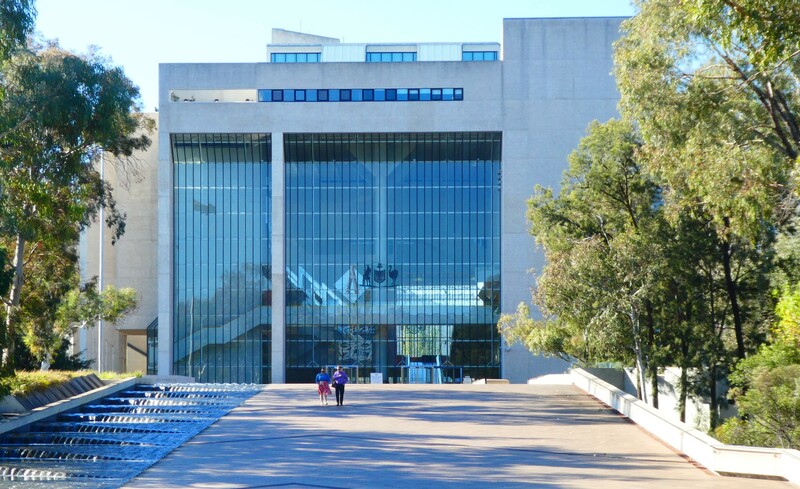 And the pretty imposing National Library of Australia. 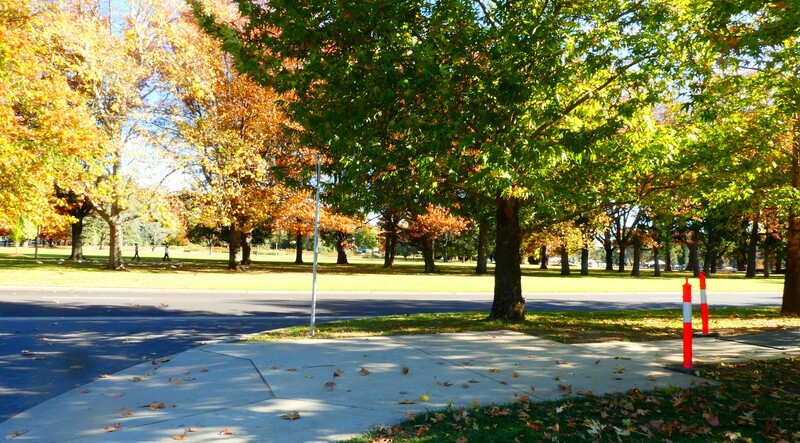 The whole area is sprinkled with lovely parklands, and after the exhibition, I wandered my way through autumn leaves across to King George Terrace and Old Parliament House. 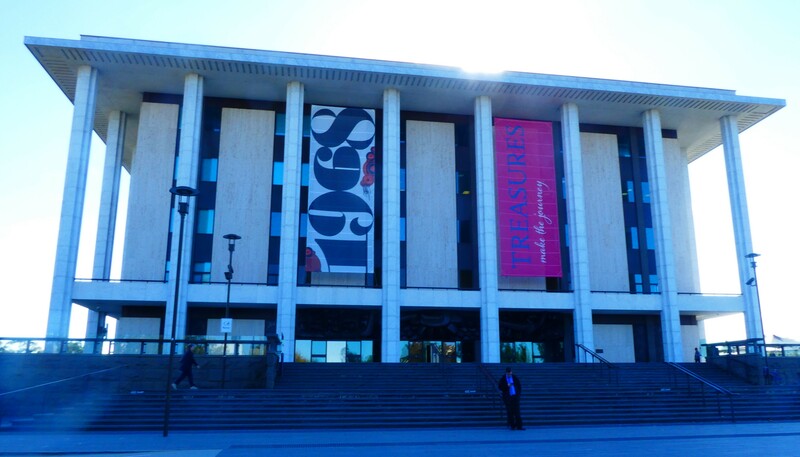 Old Parliament House is now a museum but it served as the home of the Australian Government from 1927 to 1988. It’s a lovely building, and next week I will take you on a tour of its rooms and its gardens, which would have been very comforting, I think, to politicians under stress. 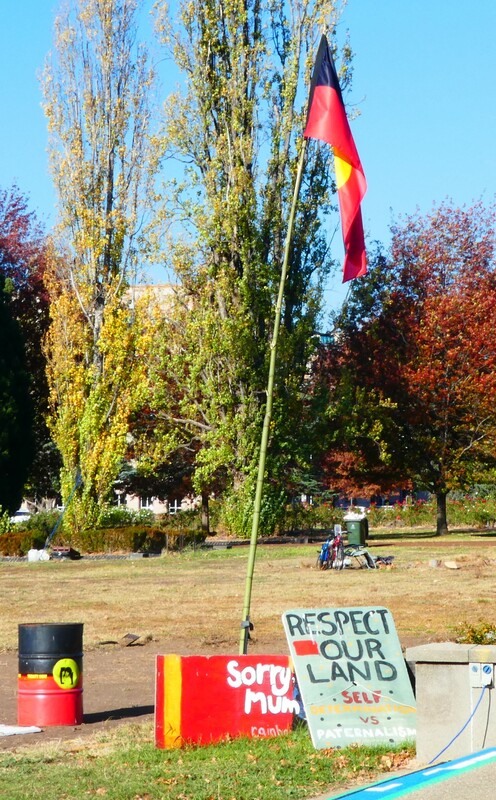 On 26th January, 1972, four indigenous men set up a beach umbrella on the lawns in front of (then) Parliament House, describing the umbrella as the Aboriginal Embassy. The men were protesting the McMahon Government’s unfair approach to Indigenous land rights. 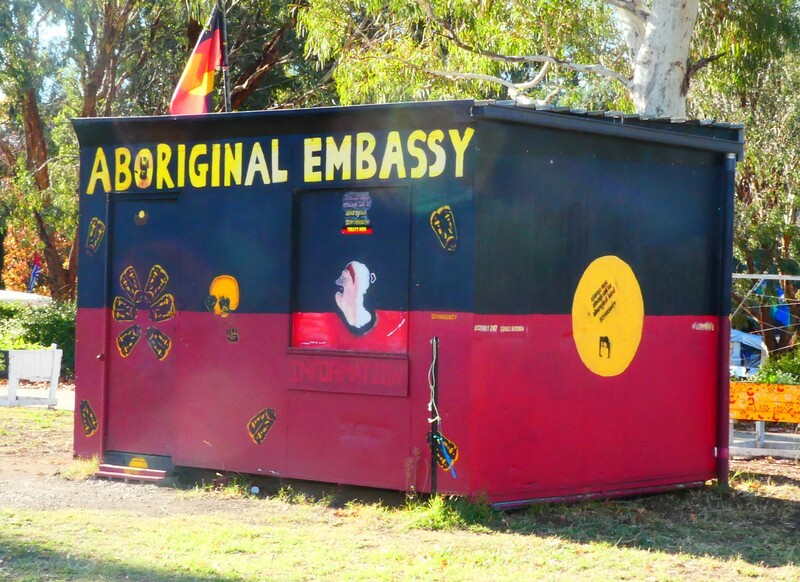 As landless people, they were foreigners and so needed an embassy. 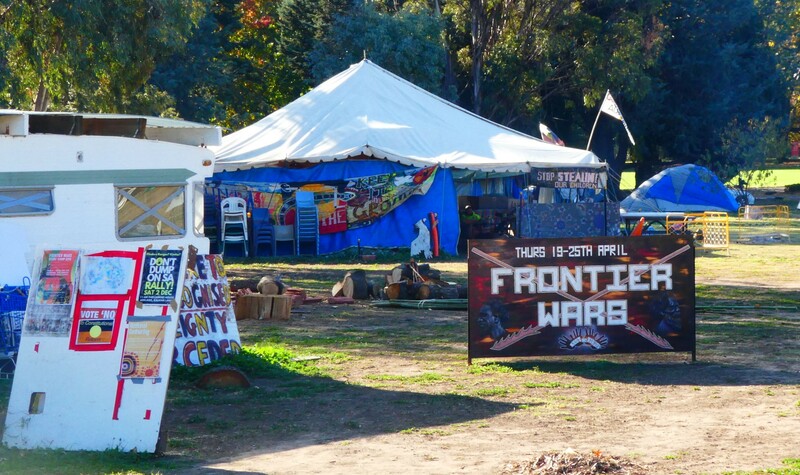 The umbrella was then replaced by tents, a well-understood image of poverty and impermanence, and it became known as the Tent Embassy. The Embassy operated in a number of locations over the years before its permanent establishment on these same lawns in front of Old Parliament House in 1992. The goals of the protestors have also changed over time, and now include not only land rights but also Indigenous sovereignty and self-determination. Rising from behind Old Parliament House is the present Parliament House, opened by Queen Elizabeth on 9th May, 1988. Its design gets a bad wrap at times, but I like the way it seems to rise out of its grassy hill, as if part of it. 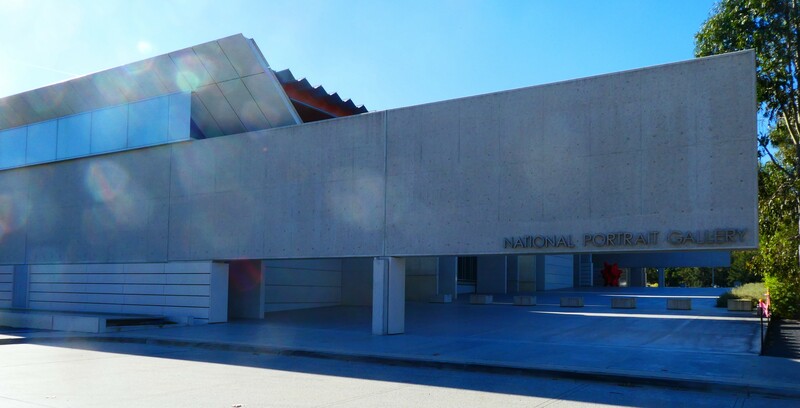 My intention, while I was in Canberra, was to sit in on question time at the House of Reps, as they were debating the new budget and I wanted to see the politicians in the flesh, so to speak, and on the job. It wasn’t happening until the next day, though, and as I also wanted to spend the next morning exploring Old Parliament House, I headed back to where I’d left the car, in the car park under the National Gallery and back to my motel in Watson, making sure not to get lost as I had the night before in the rabbit warren of Canberra’s suburban streets. 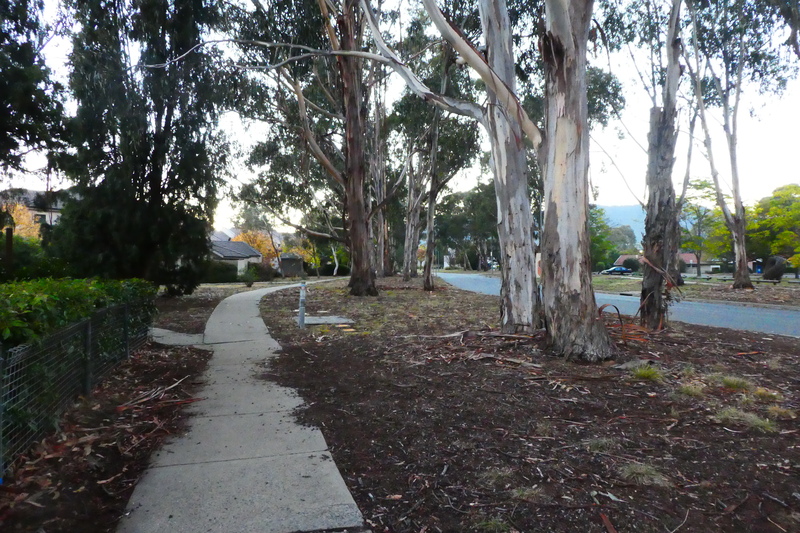 My Canberra street, very organic. Like the U.S., Australia is so large, a foreigner has a hard time seeing much of it. 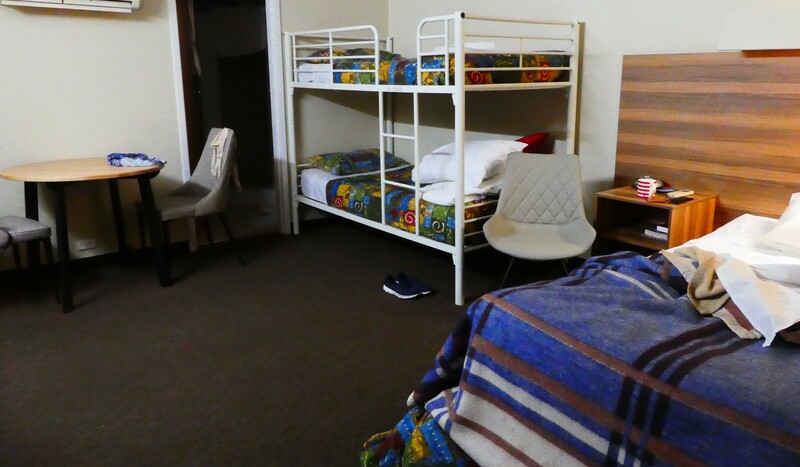 We have made it to Sydney and a few other places, but the next time we shall have to try to get to Canberra. I know what you mean. 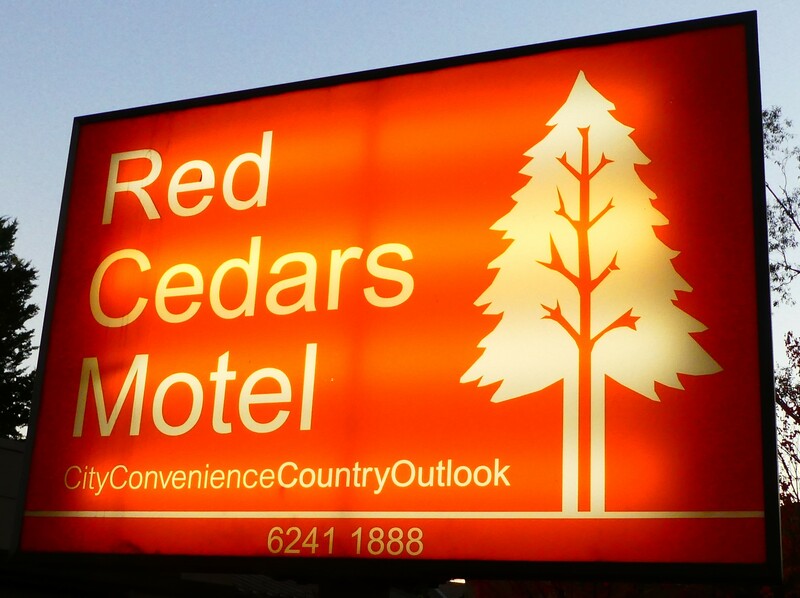 And Canberra is an out-of-the-way place, as well. You don’t exactly pass through on your way to anywhere. Cheers. 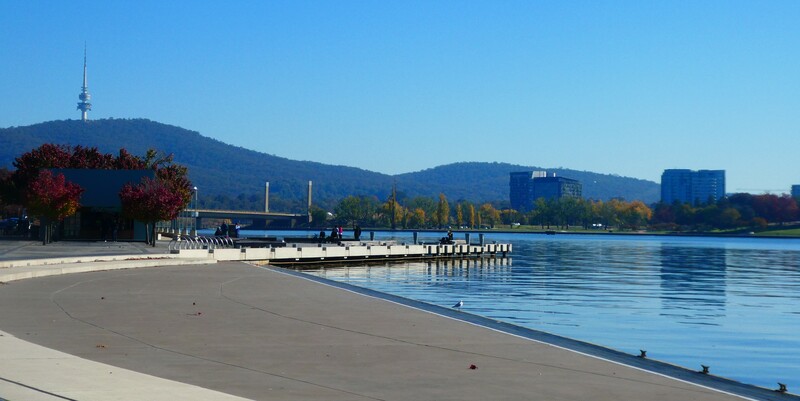 I love Canberra, a lovely city. I veer between liking and not liking it, Penny. Haven’t decided. I think if you lived there you’d get the hang of it. Just don’t get lost in the dark like I did on the first night. Those streets are a rabbit warren. Have never been to Canberra though we lived in Melbourne for several and travelled widely round the eastern seaboard. I think it gets very cold in winter so spring or autumn might be the best times to go – one day! Probably, Rosemary. It was chilly when I was there but got to 20 each day, so lovely. Yes, it’s an unusual place. All planned of course, rather than just falling into place like a lot of them. I passed through Yass on the way through, Lesley. It looks like a lovely town.